← Making Homemade Play Dough Review – Is it Worth it? Using a Neti Pot for Nasal Irrigation – Does it Work? A Neti Pot is an old-fashioned-turned-popular-again device used for nasal irrigation. Looking something like Aladdin’s lamp, a neti pot is filled with a saline solution and used to flush extra mucous from the sinus cavities. When used properly, water flows in one nostril and out the other, taking all your yucky goobers with it. Nasal irrigation has been used for centuries by natural health advocates as a way to prevent sinus infections (sinusitis), hay fever, and promote good sinus health. But does using a neti pot for nasal irrigation actually work? I only became aware of neti pots a few years ago, as a friend was telling me that she used one daily at the advice of her naturopath. She swore that she and her husband had not had any colds since using it. Honestly, pouring water in one nostril and out the other sounded a little freaky-deaky to me, but if it works… I tucked the idea in the back of my mind for future reference. Last spring I ended up with a nasty cold. Eventually it turned into a super yucky sinus infection. It got so bad I needed antibiotics to clear it up. I was miserable. I’d never had a sinus infection before, and this was only the second time I’d taken antibiotics in my life. I was determined to not let it happen again, if I could help it. The next month, when I felt that tell-tale tickle in my sinuses (you know the one you get right before the cold hits) I ran out to pick up a neti pot. I had picked it up on the way to work, and did not want to wait through the whole day to benefit from its use. So I watched a how-to demo on YouTube, and trotted off to the bathroom at work to irrigate my sinuses. Funny thing about those YouTube videos: the neti pot demonstrator is always cool, calm, and collected. Like pouring water in your nose and letting it drain out the other side is no big deal. (Spoiler alert! It is a big deal! I do NOT recommend trying this for the first time in a public bathroom!!). I carefully read all of the instructions and mixed the provided saline packet into warm tap water. * I tipped my head forward over the sink, placed the spout up one side of my nose and started pouring the water in. Then I almost drowned. I could feel the water filling my sinuses behind my forehead and had a terrifying sensation that if I took a breath it would all go into my lungs. Or that my head would be full of water forever. Some water actually did come out the other nostril. After a few seconds I paused to switch sides. As I straightened, a little warm salt water ran down the back of my throat. I could taste it, and started gagging and almost threw up. This was really hard!! Added to it was the anxiety that one of my co-workers might come in and catch me all drooly nosed, gagging, red faced, with weepy eyes. Perhaps getting the cold would have been easier! I tried again when I got home, and did better. Eventually I learned how to position my head just right so the water flowed pretty well through the other nostril, and without going down my throat or onto my tongue. I did not get a sinus infection, and the cold that came was very mild. I found that using the neti pot before bed time really thinned the mucous and helped keep me breathing easier through the night. Overall, I recommend using the neti pot. There is a learning curve to using it, and I’ve never found it exactly pleasant, but it is bearable for occasional use. I find I only use my neti pot when I feel something coming on. Otherwise it’s too much work to boil some water, then wait for it to get to just the right temp. However, I have found colds to be easier and over more quickly with saline nasal irrigation. Scientists and Green Idea Reviews agree: the neti pot works! 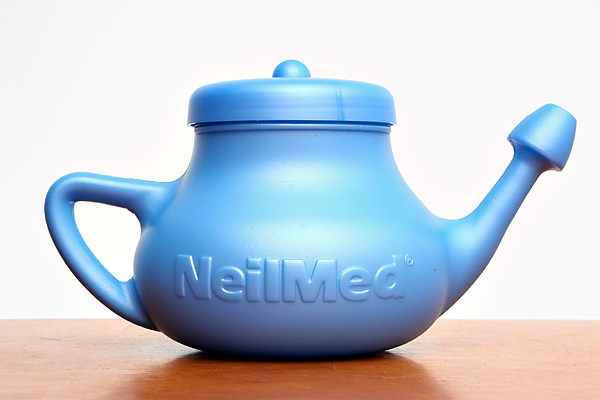 Have you ever tried the Neti Pot? Do you have any other home remedies for colds that work for you? *I used to use tap water, as this was before the warnings came out that using tap water with a neti pot can give you brain eating amoebas that can kill you. I no longer use tap water. Consider yourself warned. Also, note that I am not a medical professional and this post is not intended to diagnose or treat any medical condition, etc., etc (see “The Fine Print” above). This entry was posted in Health and Wellness and tagged better for you, health and wellness, saves money. Bookmark the permalink. 27 Responses to Using a Neti Pot for Nasal Irrigation – Does it Work? I just started using the neti-bottle. One warning though, and it’s a BIG one. DO NOT irrigate less than two to three hours before bed. You have to allow time for your sinuses to drain. I don’t remember reading that when I bought mine, so I used it less than an hour before bed. In less than one hour, I wrote up gasping for air. I could not breathe through my nose or mouth. I coughed as hard as I could and the water finally came out.I hope that you found out better than I did, Victoria. I have struggled with seasonal allergies for a decade since I moved to my current state. Years and years, I was dependent on decongestants and prescription anti-histamines. Then my husband brought home a can of “Simply Saline” for nasal irrigation – it’s sort of a “Neti-Lite.” Worked really really great, but the first time I used it my experience was similar to yours … thought I was drowning, pain, panic, gagging … deeply unpleasant. Once I *finally* got the hang of it, though, I got a proper Neti pot, and now I use it daily. I can’t believe how wonderful it feels to breathe through my nose properly, I had done without for so long! Thanks for sharing Chandra! I’ve used the “Simply Saline” product as well, when I’m too stuffed up for the Neti Pot to work. Personally, I use it in the shower since the warm steamy water helps my stuffy head want to clear up in the first place. We have filtered water that filters cysts as well and use a microwave to warm it to a bearable temperature. Antibiotics often are not very effective with sinus infections and I used to have them constantly. Since using the neti pot though I’ve not had another and it’s been 3-4 years now. Everyone should have one as a basic staple of their medicine cabinet. Although the idea has always interested me, I don’t think I could ever get past the process of pouring water into my nose! Thank you for sharing at Rural Thursdays this week. Wow! Thanks for sharing your experience! I have a feature called Things Not to Do, and if you would like to write it up from the perspective of what not to do with a neti pot, why not to do it in a public bathroom, and how not to get brain-eating amoebas (yikes!!) email me about doing a guest post! I’ve always been afraid of the neti pot, although the science does look good. When I had a series of sinus infections several years ago, I learned that eating a lot of raw garlic at the first sign of trouble can prevent a cold from spreading into my sinuses. I don’t eat it plain but spread it on buttered toast or mix it into spaghetti or beans immediately before eating. I’ve been able to fight off illnesses of all kinds before they get serious since I started taking a Vitamin D supplement every day. I like your blog! I can’t handle the neti either, so we do raw garlic – but I don’t have to eat it! I smash it up and scoop it up into empty gelatin capsules. And grapefruit seed extract drops in juice. Great post. I’m interested in reading more of your posts. I use the Neti Pot whenever I get a cold. It helps to say “ka, ka, ka” over and over as you are pouring the water in, it forces air out of your throat and it keeps you from drowning! I have found that it is really effective! A lot of the doctors I work with recommend them – but be sure to use distilled or boiled and cooled water – no brain-eating amoebas for me please! I was way too squeamish about the Neti Pot, so I was happy to find out there’s actually a squeeze bottle from the same company. You don’t have to worry so much about having your head at the perfect angle. It uses the same saline solution to accomplish the same thing. Like Foxmom, I use it in the shower. I have regular headaches (not migraine) that are greatly reduced with regular use. I used to keep a filter bottle in the shower until I read the amoeba story. Now I boil. Thanks for the reminder of the spray bottle, Pam. There is also a saline spray in a propellant free aerosol can on the market that I’ve found helpful when I’m too stuffed up to use the Neti Pot. LOL. Yes it is a really strange sensation to use the neti pot. The first time I used it was at home when I caught a cold. It really helped to unplug my nose & let me breathe easier. I use distilled water so I’m ok with that. I find putting a little baking soda with the salt solution makes it gentler. Can someone knowledgeable answer please? I had a tumor removed from a vocal cord several months ago which has left my throat very tender and sensitive. Frequently it feels more like my throat is dry and closing up. Also, I have blocked sinuses which adds to my breathing problems, however, my doctor only recommended mucinex expectorant for my throat and zyrtec for the sinuses. I use condensed oxygen with tube in my nose at night to assist with getting enough air into my throat and lungs. Maybe something here could be alleviated if I could get my sinuses cleared up. I’m a mess, I tell ya! Question: Could I use the saline spray or saline/netti pot to help open and clear up my sinuses without the salt irritating and causing more sensitivity to my already damaged throat? I would greatly appreciate some guidance….and thank you in advance. Hi Anne – I recommend checking in with your doctor on this one. Sorry for the confusion Anne. I wasn’t clear from your original question that you had already discussed neti pot and saline rinses with your doctor. I hope you feel better soon! No problem. However, my doctor did not mention netti pot or saline rinses. He has not made any recommendation at all, which is what I am eeking. I guess my original post must not have been clear, ? Thank you. I recommend using the “original” Neti Pot and Neti Salt from Himalayan Institute. https://www.himalayaninstitute.org/about/press/neti-pot/ I followed the instructions and mastered the technique easily. It’s all in the head position! The Neti Salt includes a measuring spoon, so you always get the proportions right. In addition, they recommend some exercises to clear the remaining liquid from your nasal cavity. With the suggested exercises, excess water is expelled eliminating the boggy feeling in your head. The whole process works well for me. I also use it when my nose and throat get too dry. I use a CPAP and even with the built-in humidifier my nose can get dry and uncomfortable. Low humidity in my house can also affect my nose and sinuses. I bought the Eco-Neti Pot and a jar of Neti Salt for about $18. + shipping. Enough salt for very, very many uses. No new stuff to buy every few times. Highly recommended!